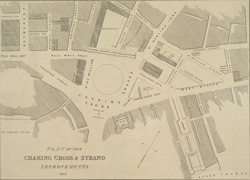 Trafalgar Square is indicated in this plan of Charing Cross as King William Square. The National Gallery of Painting and Sculpture is also indicated on the plan. Founded in 1824, the National Gallery was initially housed in a building in Pall Mall until a more suitable one was built on the north side of Trafalgar Square in 1832-38 to a design by William Wilkins.